Troy, MI WW/Press/December 11, 2015 – Caridad Pastor, Attorney with Pastor and Associates, was selected for inclusion in the forthcoming Top Attorneys of North America 2015-16 edition of The Who’s Who Directories. The accomplishments attained by Ms. Caridad Pastor in the field of Legal Services, warrants inclusion into the Top Attorneys of North America. Caridad Pastor is the founder of Pastor and Associates and has been serving the international community for over two decades. Ms. Pastor has worked for and partnered with various world-wide recognized organizations before she established her own law firm in Michigan. While Caridad was the Director of Migration of the Archdiocese of Detroit, she tirelessly lobbied in Washington, D.C. on many issues among them to bring an immigration court to Detroit, Michigan. Ms. Pastor is well known for fighting on behalf of clients who have been waiting for their green cards or citizenship for over a decade. By filing numerous Mandamus law suits, she has been able to get her clients the green cards in less than a month and U.S. determinations rapidly. She is recognized for filing numerous Habeas Corpuses on behalf of detained clients . These legal actions against ICE and other federal immigration agencies have stopped the deportation of her clients and have led to their immediate release from wrongful detention. Caridad received her J.D. from the New York University Law School and is a member of the State Bar of Michigan, AILA – Detroit Chapter, ABA International Law Section, ABA – International Litigation Committee, Federal Bar Association Detroit Chapter, CO Chair Detroit Chapter Immigration Committee, and founding member of the U.S. Mexico Chamber of Commerce Great Lakes Division. She was also a recipient for the Pro Bono award from the Federal Eastern District of Michigan 2014 – 2015 and the National Hispanic Scholarship. 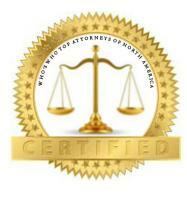 Be the first to comment on "Top Attorney – Caridad Pastor"